FredHeads waiting in the wings to help! · Romney - raised more money in his first month, but largely because he organized his big-dollar donors ahead of time to give himself a bit splash and he loaned his committee at least $850,000 weeks before filing his statement of candidacy on Jan. 3. (2) Under FEC rules, a candidate is not allowed to raise funds “in excess of what could reasonably be expected to be used for exploratory activities”. Thompson has raised an appropriate amount for an exploratory phase. Considering these rules, it is interesting that . . .
· After being attacked for raising “too much” money, Thompson is now being attacked for not spending his entire Exploratory focus on raising money. 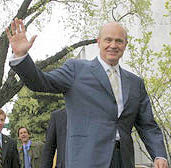 (3) An inquiry to the Fred Thompson campaign revealed that they have not even used any direct mail or telephone fundraising and their expenditures have been very low meaning that an estimated 80% of funds will be available for the primary. Again, the above figures do not include the numerous national fundraisers in July that were help to encourage Fred Thompson to run. Naysayers trying to play down Thompson's first month appear to be "blowing smoke" and making themselves look rather stupid. While the other GOP candidates work diligently on their campaigns, unlike the political pundits, they know that Fred Thompson campaign fundraising ability cannot be dismissed. Which begs the question: What happen when the campaign turns the committed Fredheads lose to help go after smaller grassroots donations via phone banks and the mail?